'Allo....My mustache makes hipsters weep with envy. Weep, WEEP before my superior facial hair! The sad part is, I found several pictures of this man where his 'stache isn't groomed into a handlebar. It's just....there. All bushy and scraggly. But, those pictures were all the wrong size, or of not great quality, or were paintings. So, this is the one you get. And you must admit, that's an impressive mustache. He is the subject of todays post, and I'll get to him in a minute. I just want you all to sit back, sip your coffee, and just......bask in that mustache. In an era when facial hair was impressive, his was amongst the most impressive. And that's as it should be for a king. But I promised you all an exciting answer to yesterdays Made Up Monday, and I aim to please. Or, at least aim. Or, at least give you an answer. Ok...It's not exciting. It's just an answer. I promised excitement in a fit of....I mean, I said ti would be exciting because....well....SHUT UP! It's called Made Up Monday. MADE UP! So, I made up the fact that the answer would be exciting. I had to make something up, because it was true. Iron Eyes Cody wasn't really a native American. He was 100% Italian. When he moved to California to begin an acting career, he was first cast as an extra as an indian. Thinking that was his route to stardom, he changed his name to Tony 'Iron Eyes' Cody. He lived his life like he was a native American. He and his wife even adopted an actual native American baby of Dakota heritage. While he never actually lied about his heritage, he never corrected people if they got it wrong. It wasn't until after his death in 1999 that most people found out the truth behind Iron Eyes. Anyway, back to King Mustache. So, what makes a former king of Italy the subject of an oddities post? Believe it or not, it's not his facial hair. No, it's the circumstances of his last full night on Earth. On July 28th 1900, Umberto and his wife, Margherita, dined in a fine restaurant in the city of Monza. One of the other patrons noted to the king that the owner of the restaurant bore a striking resemblance to the king. In fact, they were nearly identical. The king asked to meet this doppelganger, and was amazed to find that there was a remarkable similarity between them. The king asked his name, and the owner replied, "Umberto, your majesty.". As it turned out, not only did they look alike, they shared the same first name. The king presented his wife, and the restaurant owner presented his wife. Her name was Margherita. Umbertos wife, I mean. Both Umbertos. Their wives also shared a first name. But wait, it doesn't stop there. The king was impressed with the meal and asked how long Umberto had been open. As it turned out, Umberto and his wife opened their restaurant on the same day that Umberto was coronated as king. After a small chat about the nature of coincidences, Umberto left the royal couple to their meal. They finished and left, and everyone marveled at how amazing the similarities between the two Umbertos was. You'll remember, I said this oddity was about the kings last full night on Earth. 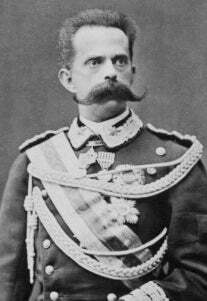 That's because, the next evening, July 29 1900, Umberto I was shot dead by an assassin. Umberto the restaurant owner never found out, though. On the same evening, as he was preparing for that nights service, he was also shot dead. At about the same time as the king. I had originally considered the story of the two Umbertos for yesterdays Made Up Monday. But there were just too many coincidences. So, if yesterdays Made Up Monday seemed weak, that's why. I thunked it up on short notice. But I hope today's made up for it. On November 11 1911, three men were hung for the crime of murder at Londons Greenberry Hill. The three mens names were Green, Berry and Hill.